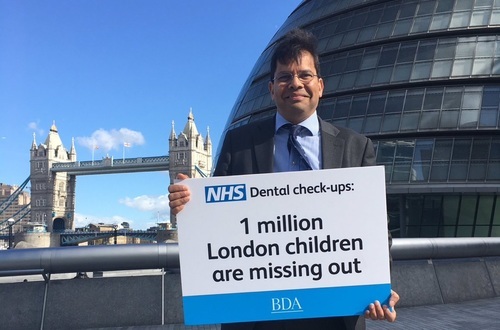 The BDA’s Len D’Cruz, giving evidence to a London Assembly inquiry, said: “Decades of improvement in children’s dental health are heading into reverse.” The BDA urged the Mayor of London Sadiq Khan to follow the example of other city leaders, and tackle deep seated oral health inequalities among the capital’s children. Len D’Cruz giving oral evidence to the London Assembly said: "Across London decades of improvements in children’s dental health are heading into reverse. The Mayor must now lead where Ministers have failed to do so. When the capital’s NHS is under huge pressure we do not accept it’s inevitable to spend £7 million each year removing rotten teeth from children. "London faces unique challenges, with a million kids missing out on free care, and teenagers in some communities risking oral cancer through betel nut and paan consumption. From public health campaigns to supervised brushing in nurseries – the Mayor can offer more than the radio silence we’re getting from Westminster. Dentists back Mayor Khan’s bid to make London the world’s healthiest city. But that can only be achieved by tackling the deep and persistent oral health inequalities that blight the capital." While nationally there has been a slow but steady improvement in child oral health, 10 of the London boroughs have also seen a marked deterioration in children’s outcomes over the last two years, with children in areas like Camden and Sutton up to a 25% more likely to suffer from tooth decay now than they were two years ago.